I should be working now but instead I’m writing to you. You see, I’m a procrastinator. Please help me stop putting things off! I check Twitter to see if anyone retweeted my tweets and who new is following me. Finally I consulted my go-to cognitive therapist for help with the Twitter addiction. I had to go cold turkey to give up reading my tweeps’ tweets. The problem with not procrastinating is that whenever I do plunge into a project, it creates even more work. *Take for instance the rare closet go-through. I end up with a pile to give away, a pile for alterations and the dreaded maybe pile, all of which creates more things to put off than I started with. On a positive note, when it comes to tasks like answering mail, if you wait long enough, they no longer require action. I thought it might be useful to see what others have said about procrastination. 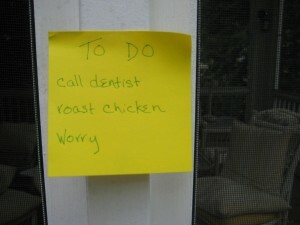 Prioritize a to do list. And then, try not to do what I do, which is to perform the easy, non-urgent tasks, so I can get the thrill of crossing them off the list. Make a list of distractions, and then consult the distraction list to reward yourself for getting something done. Decide how often you will allow yourself to receive a distraction reward from the above list; use a timer. Try for peer pressure: Find a procrastinating buddy and check in with each other at the end of the day to see how you did. Break tasks into smaller, more easily doable, events. Eat some chocolate while you work to make it more fun. Give yourself an alternative task that needs to be done and choose: I can either do my work to meet my deadline or I can organize my closet. At least you may get an organized closet out of this arrangement, though with the above *caveat. Finally, just because something ought to be done, doesn’t mean you have to do it. Will you be happier embracing your Procrastinator and continuing along the slacker path? 7 Responses to "Dear Susan: I’m a Procrastinator"
I’ll read your reply the day after tomorrow. I have lately become a wicked procrastinator. I should never have started “Words with Friends”. I have about 15 games going at once and every time some one plays me, my cell phone makes a little ding so naturally I rush to my ipad or computer to see what they have done and then of course, I continue to play. How quickly time flys. My husband is getting rather annoyed by this but I can’t stop! When i clean out my household closets , my room, guest room, kids multiple rooms, I empty the entire closet onto my bed (which of course is already made) I cannot procrastinate because if I do I will be sleeping on the floor! Often I plunge into kitchen cabinets and just like everyone else I often step back about an hour in with counters full and think BOY I am in the middle of a REALLY bad idea! I do not walk away though…..it is worse to walk back into later!